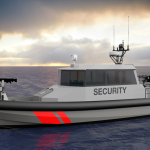 This 16m Patrol boat is designed by Camarc Ltd, and provides fast and efficient running at transfer speeds, combined with excellent sea-keeping. The design uses the 16m Pilot Boat hull form designed by Camarc, a hull form that is operated by pilotage authorities in the UK, North America, Europe and the Far East. The hull design is an advanced double chine hull, developed in conjunction with U.K. towing tank facilities since 1983. The double chine hull combines a number of advantages; finer entry in the forward sections, efficient spray rails to keep the deck dry and to damp motions in heavy seas, a more sea-kindly shape in the forward slamming area, with a chine shape at the aft end to give stability in following seas. The double chine shape also exhibits economical operation at cruising speed. The double chine hull has excellent manoeuvrability, as has been proven by the vessels in service, both at slow speed for harbour operation and at service speeds for pilot boarding operations. The GRP structure is designed and built to drawings approved by Lloyds Register of Shipping in accordance with the (LRS) Special Service Craft (SSC) rules. The hull, deck and superstructure are moulded in permarnent production mould tools The vessel is designed to have a minimum service life of 15 years allowing for projected operating hours are 3,000 – 4,000 hrs/year. The spacious wheelhouse, which can be resiliently mounted to reduce noise levels, offers the flexibility to accommodate a range of possible customer requirements but typically accommodates 2 crew plus 7 passengers on high specification suspension seating to maximize comfort in high sea states. Below deck areas can be customized to feature a full galley fit, toilet and washing facilities, storage areas and a saloon. The flexibility of the design is further increased as we can offer a choice of two widths of wheelhouse along with an option without a coachroof which can be configured to meet customer requirements. The craft has been optimized for reduced downtime. The spacious engine compartment gives plenty of working space around the machinery for ease of maintenance and a large removable engine hatch enables the engines to be lifted out of the vessel with minimum effort. The craft features an innovative “Camarc” popsure fender system. This gives the benefit of no through hull fasteners and reduced stress on the hull. The outer tube takes any abrasion while the modular foam outer spreads any loads over a large area. The modular nature of the fender allows any damaged sections to be easily replaced. The basic craft may be configure to carry a variety of weapon systems and can be fitted with ballistic protection to the superstructure and ballistic glass to the windows. Other military related equipmet such as thermal imaging cameras, military communications, surveillance systems, etc. can be fitted. Military options Thermal imaging camera, military communications, surveillance systems, weapon mountings, ballistic protection to structure and windows. Special Features – Including but not limited to: Comprehensive navigation systems, High performance hull designed by Camarc, ergonomically designed console, Camarc “Popsure” closed cell polyethylene fender, Hadrian safety rail system, MOB recovery system, design optimized for ease of maintenance and reduced downtime.